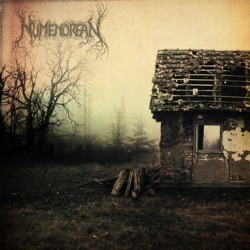 Numenorean is a new Canadian atmospheric post black metal band form Calgary, Alberta. They started in late 2011 as a two-man project by Byron (composition, all instruments) and Brandon (vocals) with the intention to mix aggressive and melancholic black metal with more tranquil and ethereal parts. They recorded a 2-song demo, which was released via Filth Regime Records on June 2014. The band also got a complete line-up and started its first live shows with the release of the demo. Except for the physical CD edition by Filth Regime Records, which is limited to 100 copies (the first 50 copies were hand numbered and sealed with wax, now sold out), the EP is also available digitally in the band’s Bandcamp page. Numenorean are not redefining the genre, but they come out of nowhere with a professional demo leaving only promises for the future. They are now preparing their debut full-length album and will start recording it on February 2015, planning to release it on the summer of the same year. They definitely deserve the attention of atmospheric post black metal fans!